The afterlives of terrorists are a curious cultural fascination. We’re not talking here of Martin Amis’ middle-aged and concupiscent fascination with the reward of virgins, but rather what happens to a state’s most violent internal enemies, those who took up arms against it, once their movement has passed into history. Ulrike Meinhof and Andreas Baader’s stories went with them when they died in Stammheim; Mohammad Sidique Khan and Shehzad Tanweer will never tell the tale of their suicide attacks on the London Underground in July 2005. But those who do survive show a remarkable propensity to reflect in public on the meaning of their actions. Bill Ayers, a leader of the Weather Underground has published his memoirs, and ex-RAF member Astrid Proll speaks publicly in the UK. Even fiction concerns itself: Hari Kunzru’s roman à clef of the Angry Brigade, My Revolutions, plots the personal crisis of a rediscovered urban guerrilla. There could be an element of nostalgia to this reflection, as an age of political terrorism comes full circle. Just as Bob Hoskins realises with horror at the end of The Long Good Friday that he is not dealing with tractable gangsters, but the implacable wrath of the IRA, so now do our recollections of the red terror of the 1970s contrast cosily with the image of Islamist terrorists, who do not even offer demands for negotiation. Cathy Wilkerson’s moment of notoriety in the history of left-wing political terrorism was her involvement in the Greenwich Village townhouse explosion in 1970. Wilkerson and four other members of the Weather Underground were using her father’s house in preparation for an attack on an army officers’ social event at Fort Dix. An unplanned detonation levelled the townhouse, killing all present but Wilkerson and Kathy Boudin, sending Wilkerson underground for ten years. In Flying Close to the Sun, Wilkerson attempts to put her actions into context: to explain how her political involvement led to terrorism. From a relatively privileged background, she received a Quaker college education, and her first arrest at the age of 18 was in a civil rights protest to improve conditions at a school in a local black community. The real crucible of her radicalisation, however, was Students for a Democratic Society. Initially the youth wing of a small socialist organisation, by the mid-1960s SDS had an important role in the burgeoning American protest movement, energised by both increasing US involvement in Vietnam and vicious racial oppression in American society. Having flirted with electoral politics as a congressional aide, like thousands of her fellow students she soon decided that more serious change was urgent than congress could allow. Wilkerson briefly edited the SDS paper, New Left Notes, and became a Washington organiser. Like Jane Fonda, she made a solidarity trip to Hanoi, but due to US bombing never got further than Cambodia. The SDS wavered between the urgency of the anti-war struggle, and black liberation battles at home. Theoretically, they bridged these gaps by defining black America as an internal colony, fighting the same anti-imperialist war as Ho Chi Minh. Practically, they struggled with the problem of being an organisation mostly composed of privileged white students. Eventually they disintegrated in a faction fight between workerists favouring industrial infiltration and those in favour of mobilising the immediate anger of youth. The latter faction won, and SDS became what was at first known as Weatherman, and then the Weather Underground (pedants note: the name comes from "Subterranean Homesick Blues"; like ‘situationism’, ‘weathermen’ is a frowned-upon back-formation). From organising premeditated riots like Chicago’s ‘Days of Rage’ they quickly proceeded to planning individual acts of terrorism. Wilkerson’s own account of these events is detailed, though her style is fairly leaden. The section detailing her SDS years, and the alphabet soup of left-wing politics (ERAP, SNCC, NLF, WUO…) is both much longer and less interesting than the description of her time as an armed insurgent. The strange sexual bonding practices of Weatherman and the comical inability of liberal arts graduates to wire a pipe bomb correctly might both merit more attention than the minutiae of SDS organising work. As a reader, you want to cut to the chase: we know what this book is really about. But her account is also persistently underlaid with reflections that only make sense after the townhouse explosion. 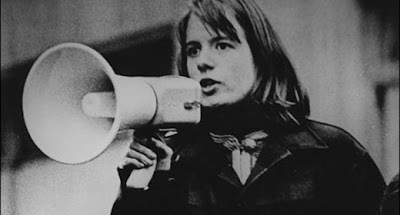 Her sporadic concern with what constitutes good and proper political leadership is later illuminated by the extent to which she feels that the leadership of the Weather Underground personally manipulated and betrayed her. Elsewhere, she follows the switch and turns of the SDS without ever providing the feeling of a progressive and personal political development. What she does convey is a desperate, almost frantic, desire to somehow use her own life to change the world for the better. Once involved in Weatherman she was committed to the extent that, she says, "I was willing to die or be hurt, but I wished it all made more sense." In fact, within both the SDS and Weatherman she consistently agitated for the fight against women’s oppression as a meaningful and important part of the overall struggle. In retrospect, she defines the key problems as dogma and secrecy: her experience since leaving the underground has taught her that life is more subtle than Weather Underground communiqués allowed. Like other ex-Weatherman members, she has substituted the local struggle for the global and now works in education. But she remains barely optimistic about anything other than that "the great lumbering people will survive." Bombs that go off when they shouldn’t, and bombs that don’t go off when they should, provide second chances. Two weeks after the July 7 bombings, six young British men attempting to do the same thing unexpectedly found themselves on the way to prison rather than the morgue. Their context could be described as similar to Wilkerson’s: an unjust war abroad, and racism at home. In thirty years’ time might we be reading the words of Yassin Omar or Ramzi Mohammed, explaining how they came to embark on the path to becoming a bomber? Danny Birchall is a London-based poet and writer. He blogs at Squares of Wheat.